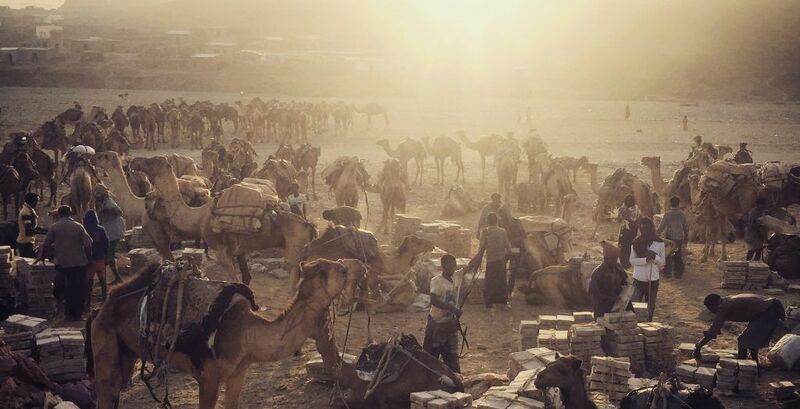 Stanley Stewart describes his time journeying to and though the Danakil Depression in Ethiopia. Described as the lowest and driest and most inhospitable place on earth and after much dissuasion by a Mekele salt merchant, Stanley Stewart finds himself in the Danakil Depression visiting the Afar people, a tribe who, historically, have been known for their affinity with castration of outsiders and whose code states that a man is not a man until he’s killed another man. In any case, Stewart describes his time being guided through this region with monosyllabic, stern-faced guide, Ali, part of Hajji Hussein’s tribe, journeying through the salt mines – one of Africa’s most ancient trades – journeying to the edge of an open topped volcano and even partaking in ‘the camel stick lottery’, a way of establishing a position in the next day’s camel queues into the mines. To book a holiday that ventures to the Danakil Depression or for a luxury helicopter safari through Ethiopia incorporating a stop-off at the Danakil, please get in touch with us and we’d love to begin planning your journey.